n the 2006 year we received a request from the luthier Dmitry Badiarov to design a Cello da Spalla setup. These are a few pictures of the first tests on it. 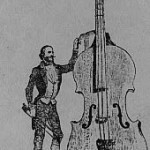 In 1996 we received a request by the Musée de la Musique in Paris for the realization of two copies of original setup of ‘Octobass built in 1850 by Jean Baptiste Vuillaume (1798-1875).